Targets are shot at 100 and 200 yards on the Rifle Range. Shooters must qualify and earn a long range pistol certification before shooting on the CRPC ranges or in a Long Range Pistol match. Matches are open to members and the public. Matches are held on the first Saturday of each month; March through November. First practice match first Saturday of February weather permitting. Please check the Outdoor Range Calendar for match dates and times. Click to go to the calendar. Production guns: Any gun from T/C Contender or XP 100 any caliber any stock center grip or rear grip as long as it has the same action and the barrel has not been changed in any manner. 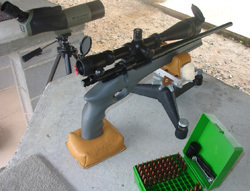 Anything you can dream up, bring it out to the rifle range to shoot.